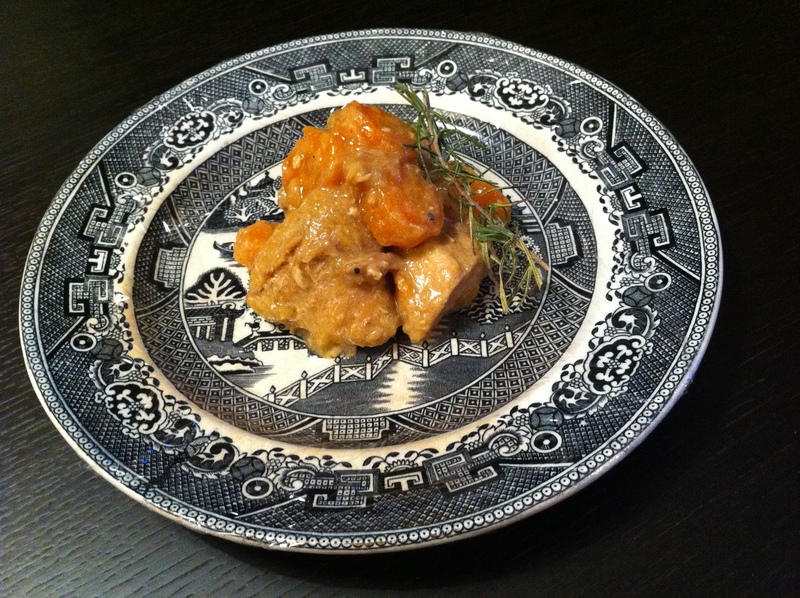 A couple of weeks ago I decided to experiment with another slow cooker adaptation. I had prepared myself towards a possible flop because after all, I was trying something quite tricky. 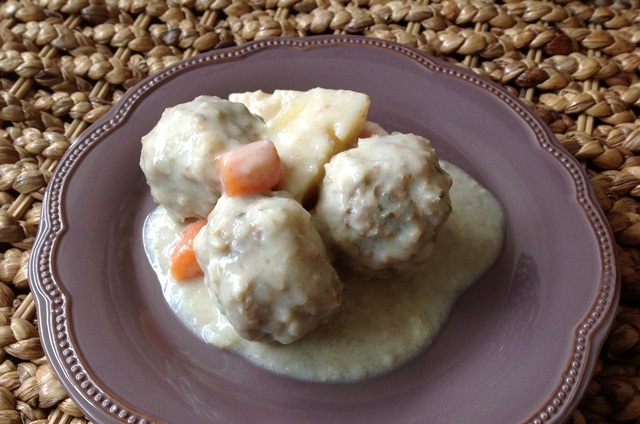 I started by looking for a traditional recipe for this dish as it wasn’t something I knew off by heart. I’d only ever made it once, the regular way, a few years ago. I found one I liked the look of, and kept the quantities to a minimum, just so that if it was going to be a disaster, I wouldn’t end up hyperventilating at the waste of good food! Well. I needn’t have worried! After the first taste test I was high fiving myself, punching the air and doing a little victory dance round the house. Yes, I was mighty proud of myself, and I still wear a bit of a smug expression when I look at the pictures! 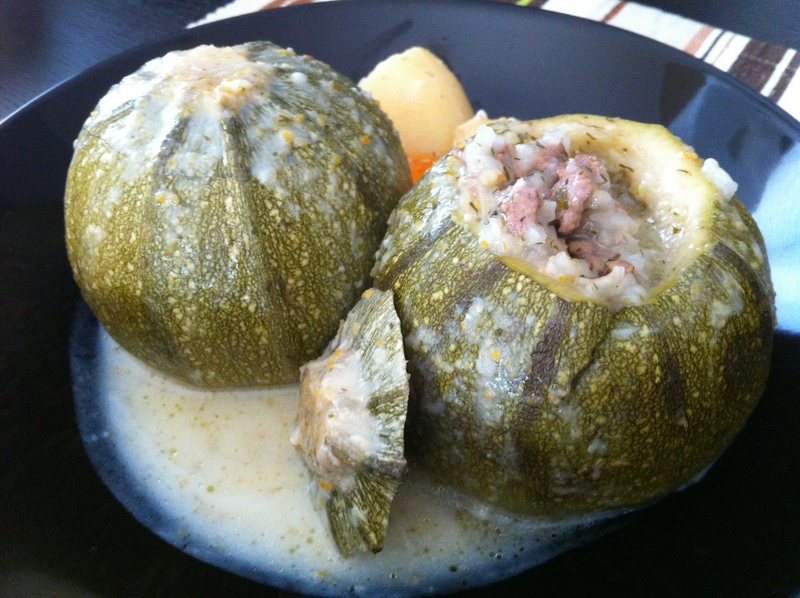 So, Stuffed Courgettes (or Zucchini if you’re reading from the US) in an Egg Lemon Sauce. Delicious. 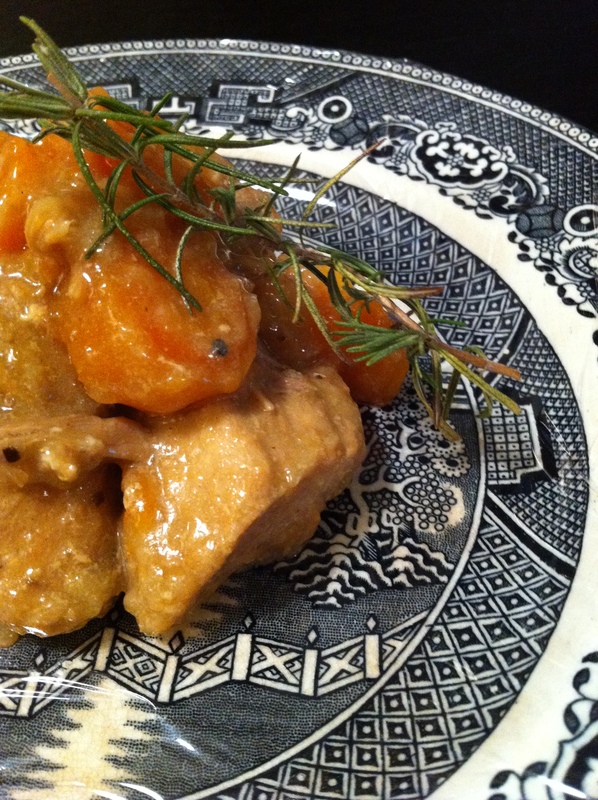 Ok, I admit, anything in egg lemon sauce is delicious for me, but this dish really is good. Here in Greece, up until a few years ago, you could only get the long green courgettes. Recently though, you see these really cute variations that have the same colour and taste, only they look like they’ve swallowed a tennis ball! Seriously, I find their almost perfect round shape hilarious, I don’t know why. When I saw some in the supermarket I thought right, I am going to try these stuffed, in the slow cooker. Actually they are ideal for stuffing as they have so much flesh, thus lots of room for filling, once the flesh is removed. Now I must warn you, this isn’t a throw-everything-into-the-slow-cooker-and-turn-on type of recipe. It takes some prepping. But it’s worth it, and you do avoid the whole palaver of trying to boil the stuffed zuckes with an upside-down plate lying on top of them (yes, I know, weird – I think it’s to stop them moving around). I’m not big on taking photos of each step when trying a recipe, usually because it’s what’s for dinner and needs to be completed in a reasonable amount of time. Also, more often than not, I’ll forget to snap a step or two and then it’s all messed up anyway. This time however, I couldn’t resist a couple of extra photos during the preparation of the courgettes – they are just so pretty. And I thought it might help readers to visualise certain aspects of the process (i.e. gutting the zuckes). And they’re so pretty. So, here they are. See I told you they were cute (ok, sorry, I’ll stop now). You start by slicing the tops off, to make little lids. Keep them aside. To get the insides out I suggest the following tools: a knife (smallish, you want good control) and –ideally- a melon scoop (at least I think that’s what that is). What a useful contraption. It came in a set of three, a citrus zester, an apple corer and this spoon-like thing that looks like a mini ice cream scoop with a hole the middle. I gather it’s for making little balls of melon or watermelon. It’s great for scooping out the courgette flesh because it’s sharpish around the edge and you can position it at a good angle inside. So, you start scooping leaving a wall around the bottom and sides of the veg. You want them to be sturdy enough to hold, but you also want room for a decent amount of filling. I left just under one centimeter of flesh. It’s a good idea to lift the courgettes and hold them in your hands while scooping; this way you can sort of feel how close you’re getting to the sides. 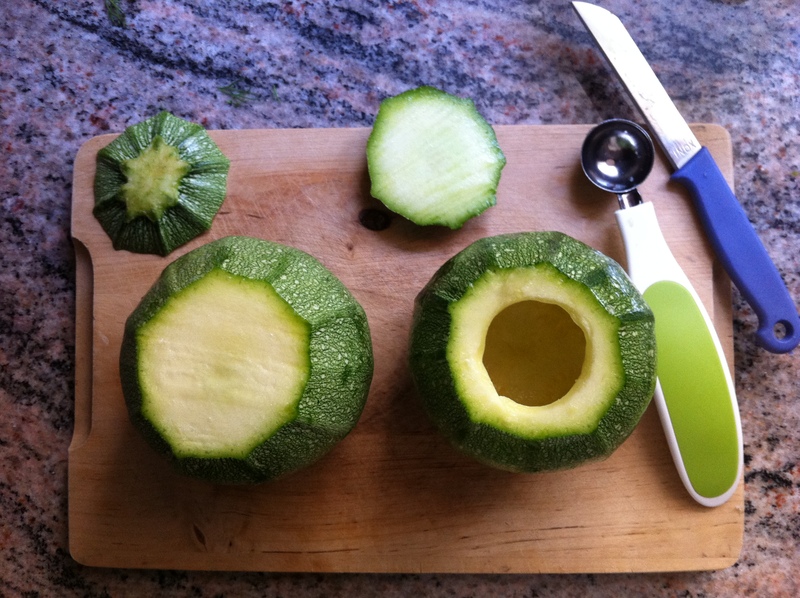 If you’re using regular, long zucchini you might find an apple corer useful, at least in the beginning. After you get the first chunks out continue with a small spoon. Remember you need to keep the flesh. Some of it goes in the recipe, some of it you can keep for something else. I made the most unbelievable zucchini bread and was planning on doing a double post today; then I promptly ate the two last pieces before I’d taken any photos of it. I do that often, I think I’d have twice as many posts up already if I remembered to take pictures of all the things I make. Aaanyway. The two round zuckes gave me 1 ¼ cups of flesh. This of course largely depends on the size of the vegetables. 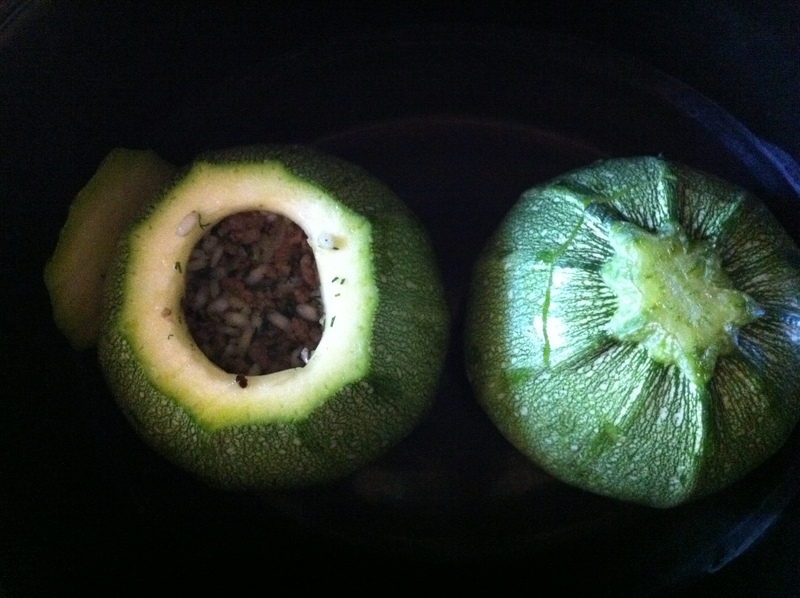 After I made the filling and stuffed the two courgettes I discovered that I had quite a bit of filling left over. 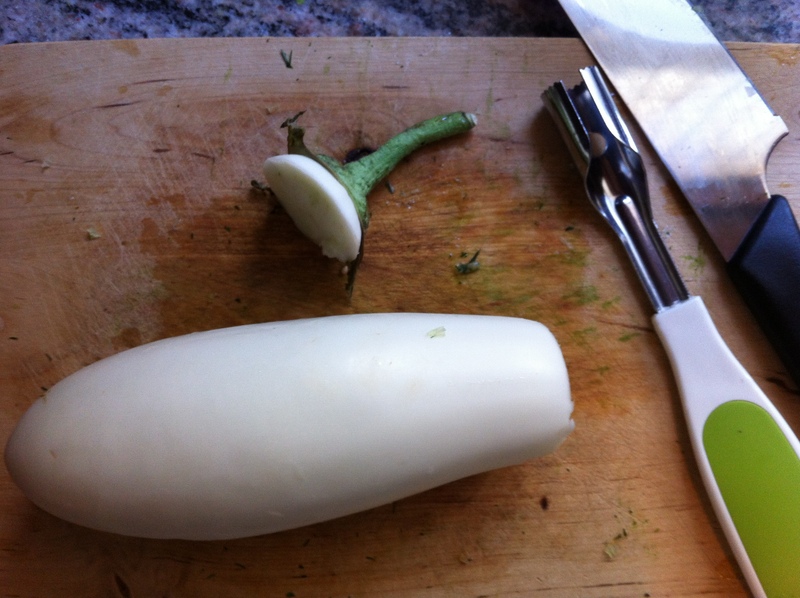 I rummaged through the produce drawer in the fridge and discovered this lovely white aubergine (eggplant), so out it came. The two zuckes fit perfectly in my slow cooker (it’s only a small one), leaving no room for anything else. So now I also had to employ the services of my second slow cooker! Now that the extra room issue was solved I decided to plop some potatoes and carrots in with the aubergine as well. All set. After they cooked for about 5 ½ hours on low and were pretty much ready, I decided to make the egg lemon sauce. This is easy, but needs some attention when it’s transferred back into the slow cooker. I tempered the eggs (for more details on this see my Egg Lemon Chicken Soup) and then poured the sauce into the slow cookers with the veg and left it for about 5 minutes on low. I then tested the sauce with a food thermometer and it was well over 140F which is the minimum for cooking eggs, so I turned the cookers to warm and served shortly afterwards. The total cooking time was about 6-6 ½ hours. Result? Gorgeous. Really tasty. And I was pleasantly surprised that they didn’t fall apart when I took them out of the slow cooker. The courgette skins had cooked to a perfect consistency. Not pull-apart-with-your-fork soft but cut-with-the-side-of-your-fork soft. The eggplant was also just right, as were the potatoes and the carrots. Success! 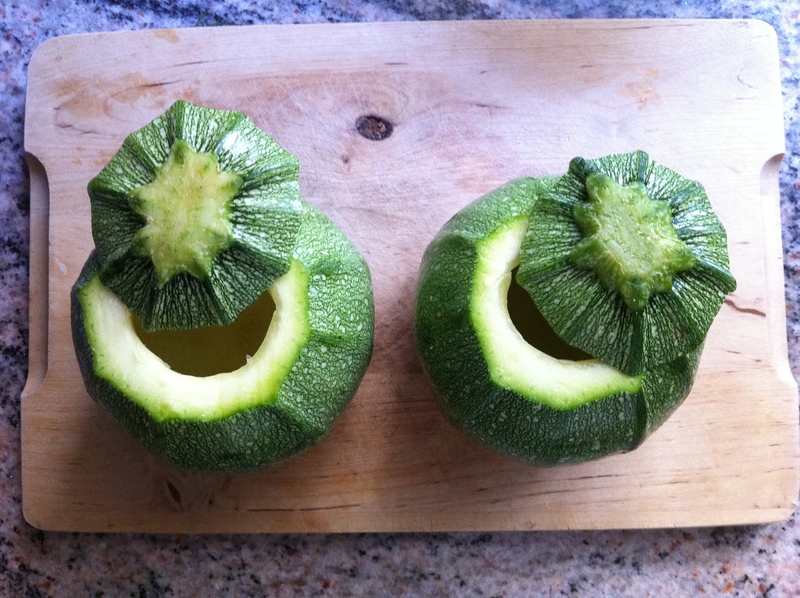 Slice off the top of the courgettes in order to form little lids. Scoop out the insides as described above, leaving a wall of flesh around the inside of the veg. Keep ¼ cup of the flesh and chop it up. Put the rest away in the fridge till you find a good recipe for it. Heat half the olive oil in a frying pan, over medium heat. Gently cook the onion being careful it doesn’t brown or burn, till it’s translucent. Add the meat to the pan, and turn up the heat to medium high. Break up the meat clumps with a wooden spoon and keep stirring till you don’t see any more pink bits. Add the parsley, dill weed, courgette flesh, rice and salt & pepper, turn down the heat a bit and continue to gently sauté over a medium heat, for about 2-3 minutes, stirring continuously. Add ¼ cup water to the pan, and let it reduce, stirring the meat mixture frequently. When the water has reduced almost completely, take the mixture off the heat and leave to cool slightly. Use a spoon to fill the vegetables with the meat mixture, leaving a couple of centimeters space from the top. Replace the lids on the vegetables and put them in the slow cooker. Add 1 ½ cups of vegetable stock to the slow cookers, so that the liquid comes up the sides of the courgettes by about 1/3. Turn slow cooker on and cook on low for about 5 ½ hours. We have mostly cooked the meat, so the only thing that needs cooking really is the rice. After 5 ½ hours try prying open one of the lids, and lifting out some filling. You will see it will have increased in volume and may now reach the top. If the rice is cooked and soft you can go on to make the egg lemon sauce. Beat the egg and lemon juice in a medium/large bowl. Slowly add spoonfuls of the cooking liquid into the egg mixture, one at a time, being careful that the egg doesn’t scramble. As you add the warm liquid you can slowly increase the size of the spoonfuls. When the mixture in your bowl is quite warm, with lots of the juice in it, take out the insert of your slow cooker and set it somewhere heat-safe. 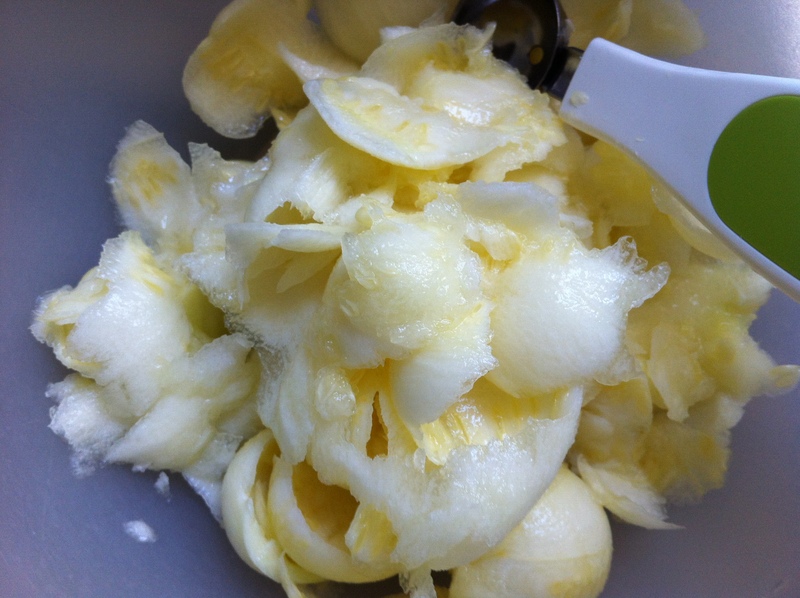 Carefully pour the egg lemon mixture back into the slow cooker, lift it and swirl it around to mix it. Put the insert back into the slow cooker and leave on low for about 5 minutes. This should do it in terms of egg cooking time. If you want to be sure, test the sauce with a thermometer; it should be over 140F. Take out the veggies, spoon some sauce over them and enjoy with fresh bread and feta cheese. 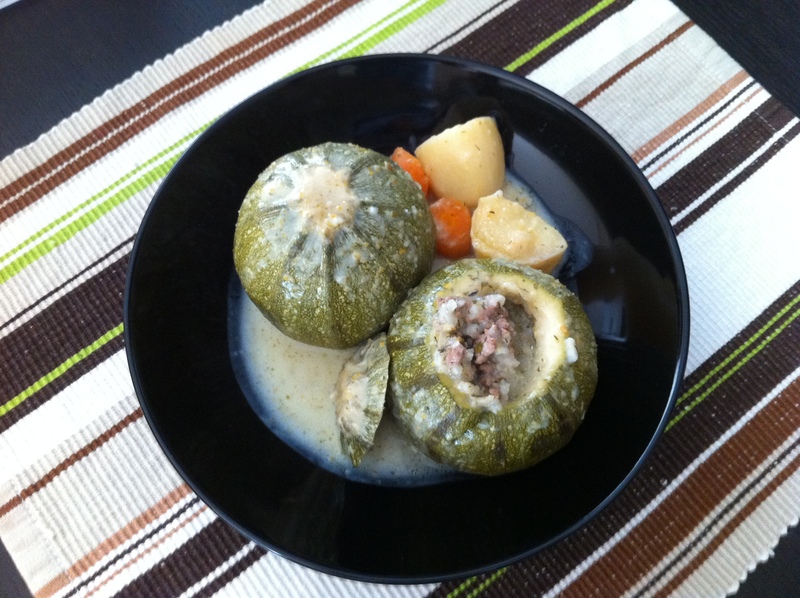 For ideas on what to do with the leftover zucchini flesh, take a wander over to Kalyn’s Kitchen. She has lots of lovely recipes for this wonderful veg, including these gorgeous Whole Wheat Zucchini Muffins with Green Chiles and Cheese. I’ve made these and they’re yummy. Finally, I found a name for my blog. I’ve been thinking about starting this for months and months, but I hit a mental block when it came to choosing a name. I wanted something catchy, then I wanted something that would reflect my bilingual/bicultural background (Greek-English in case you’re wondering), then I wanted something catchy, then I wanted a food-pairing name like “sugar & spice” or “honey & thyme”… then I wanted something catchy. Then I gave up. I thought it would come to me. It didn’t. Today, I thought right, be proactive. So I turned to my buddy Mr. Google and just typed stuff in the magic box. Somehow this brought me to a nursery rhyme site and I got the bright idea to check food nursery rhymes. I was just about ready to name my blog Little Miss Muffet, when my eyes fell on the dreaded words… “On Top of Spaghetti”! The trembling started and I quickly grabbed the mouse to get away as fast as possible from the nightmare. Ok, I’m probably not making any sense right now; bear with me. When I was little, one of my aunties in England use to sing this to me. I hated it. It scared and depressed me, and made me cry. This, however, seemed to amuse certain members of my family! After all, it’s a song about meatballs, they were just teasing me (right?). Anyway for years since, whenever I’d hear the first few words I’d clasp my hands over my ears so hard I’d nearly squash my head flat. But today I thought this was a sign, an omen of some kind. Today I am meant to forgive the idiot who sneezed, and stop mourning over the loss of the poor defenseless meatball, whose life was so cruelly cut short. So I am facing my fear and in tribute, I am naming my blog after this tragic story. And now, before you start recommending places with comfy couches (if you’ve even read this far), I’ll move swiftly on… This blog will be filled with recipes. Most of them will be other people’s, since I’m better at following instructions that creating things with my own imagination! The more I cook though, the more I’m getting a feel for doing my own thing, so occasionally there will be a triumphant creation or successful adaptation. There may be some flops too! I live in Greece but love all sorts of cuisines, so apart from say a spanakopita (spinach pie), I might also try a steak & ale pie. 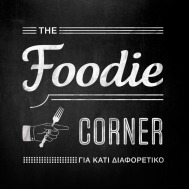 I hope you enjoy the recipes and tolerate the rambling. My first recipe couldn’t be anything other than… “On Top of Spaghetti” (meatballs in tomato sauce). I found this on a great blog called Stonesoup, on a post with a collection of meals for a new mum (the author Jules’s sister). The idea was to make various meals ahead of Baby’s arrival, freeze, and enjoy at a time when cooking wouldn’t be an option. I found that to be one of the cleverest and most organized plans ever. There are quite a few evenings here when cooking is not an option so I made a big batch and froze half of it for a fuss-free after-work dinner another day. They froze fantastically. 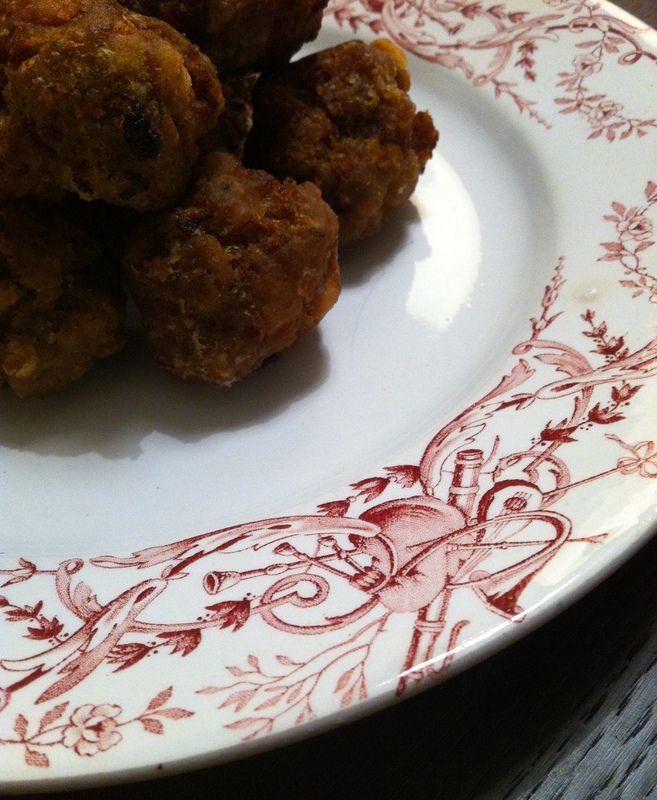 They are very easy to make and create a minimum of washing up. Win win! Enjoy over spaghetti (of course!) or rice. Or mashed potatoes. Or even quinoa. They go with pretty much everything!